Lockout boxes are ideal for group lockout situations. After the equipment to be worked on has been locked off, all lockout keys/fuses are placed inside the lockout box. When work is complete, employees take their personal padlocks off freeing the keys inside. The keys inside can not be accessed until the last employee removes their padlock, providing a truly effective lockout. Lockout Definition - Lockout is the placement of a lock out box over an energy isolation device (i.e., slide gate, circuit breaker, line valve, disconnect switch, ect. ), that ensures the energy isolating device and equipment being controlled can't be operated until the lock out box is removed. 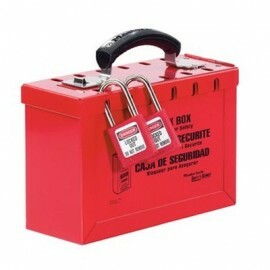 Lockout boxes utilizes positive means, that of a lock, to hold an energy isolating device in a safe position. 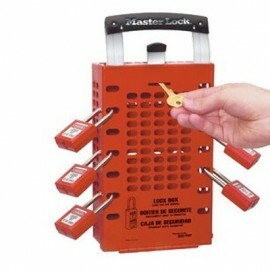 The lock out box must be strong enough to prevent removal of said device with the use of excessive force. Tagout Definition - The placement of a tag on an energy isolation device with a prominent warning to indicate that the energy isolation device may not work properly until the tag is removed. Before a lockout box is removed, the authorized employees of that lockout box will ensure that all machine components are operationally intact and all non-essential items are removed. Next, employees remove their individual padlocks, exposing keys inside to remove the lockout box. OSHA 29 CFR 1910.147 (c)(4) is the written procedure for intended use of a lock out box, procedural steps for blocking equipment to control hazardous energy, placement and removal of lock out boxes, and requirements for testing effectiveness of lock out boxes.